Personalità My friends characterize me as kind, caring, intelligent, accurate, intelligent, sociable, serious, responsible, friendly, faithful, sensual, with a good sense of humor. Letture nel tempo libero I like reading detective stories, stories about children and interesting historical literature. Mi piace andare I love nature, rest on the beach, travel. I like to get acquainted with the new culture and new people. Cucina preferita From food I like Russian, Ukrainian, Italian, Sea Food, Caucasian food. I really love vegetables and fruits, and I try to give them priority. Su di me I am a very simple person. I am open to communication. I like life, I like to communicate with people. I like kids. I like nature and flowers. I like to grow roses. 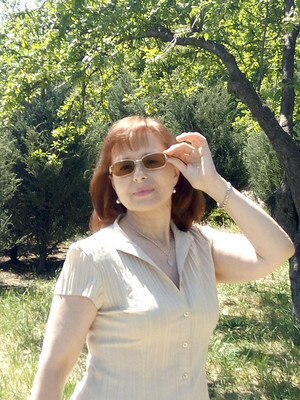 Partner desiderato I am looking for a kind, honest, educated, loyal gentleman. I am looking for my soulmate and a faithful friend for a happy family life.